Art experts have long known that The Bedroom isn't the same painting it once appeared to be. In 1888, van Gogh described it in a letter to his brother Theo, saying, “The walls are of a pale violet. The floor—is of red tiles.” Those exact pigments have since vanished after more than a century of fading, but conservation scientists at the Art Institute of Chicago set out to prove they weren't lost for good. Using a macro x-ray fluorescence scanner, Francesca Casadio and her colleagues were able to determine the elements and minerals in the paint. They also used a process called surface-enhanced Raman spectroscopy that makes molecules vibrate in a distinct way under laser light. But their biggest breakthrough came from something surprisingly simple: After flipping over a tiny sample of the painting under a microscope, a blue paint chip was revealed to be pale purple on the underside. 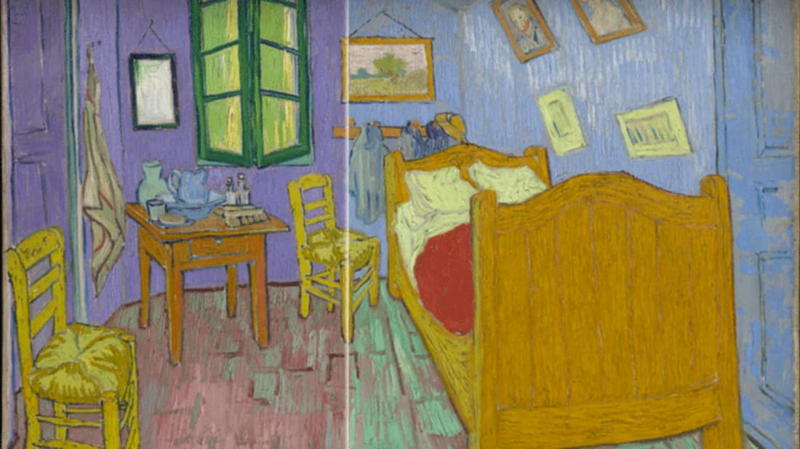 Their analysis also uncovered the order in which van Gogh painted his different versions of The Bedroom, of which there are three. The painting usually displayed in Amsterdam's Van Gogh Museum was done first, Chicago's piece was second, and the painting normally found in Paris was finished third. Instead of restoring their piece with the intended colors, the Art Institute of Chicago will display a digital recolorization, along with the original three pieces from now through May 10. This digital route is a novel one for restoring van Gogh's paintings to their original hues—it was recently announced that conservators at the Van Gogh Museum are considering removing the varnish from Sunflowers (1889) to better showcase the painting's original coloring.